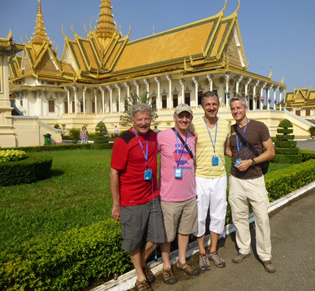 We invite you to join Brand g Vacations from October 15 – 27, 2020 for an all-inclusive, 13-day All-LGBT journey, exploring the highlights of Cambodia and Vietnam, featuring the Temples of Angkor Wat and the mighty Mekong River. There can be no more striking cultural contrast than the one between bustling Vietnam and the tranquil Cambodia. From the diverse countryside of Cambodia to the Mekong Delta, so rich in human life and endeavor, you'll discover two countries, two cultures, and two ways of life linked by one river, the Mekong. Join Brand g on a comprehensive 13-day journey through the heart of Vietnam and Cambodia featuring a seven-night cruise charter along the mighty Mekong River. 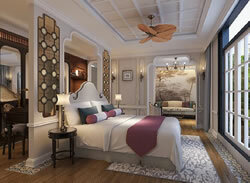 Cruise aboard the new, all-suite, luxurious Mekong Jewel, specially built to ply the Mekong River from Siem Reap, Cambodia to Ho Chi Minh City. Embracing an elegant French-colonial design similar to the many homes that once lined the streets of old Saigon, she boasts spacious suites from 258 square feet up to an expansive 584 square feet in size. 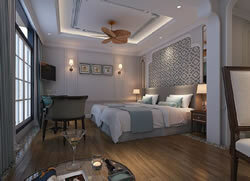 From here, you will enjoy all the wonders the Mekong has to offer in sophisticated, yet comfortable style. With never more than 22 guests per expert guide, you will enjoy enriching lectures, a comprehensive series of well-planned excursions, and most meals and beverages! 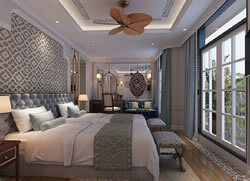 Also included is a three-night stay in Siem Reap including an in-depth visit to the UNESCO World Heritage site of Angkor Wat, and a two-night stay in bustling Ho Chi Minh City (formerly Saigon), each featuring five-star, centrally-located hotels. As a traveler of Brand g Vacations, you'll also enjoy complimentary beverages, locally-produced beer, alcoholic beverages, and soft drinks as well as house wines with dinner. Dine on European cuisine and regional specialties infused with flavors from Asia’s celebrated culinary tradition. An optional post four-night extension is available, featuring a two-night cruise on the famed UNESCO World Heritage site of Ha Long Bay. Also included is two nights and touring in historic Hanoi. 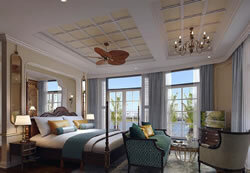 Reminiscent in design of the French, colonial-era, manor homes that once lined the streets of old Saigon, the 34-suite/68-passenger Mekong Jewel lends a sophisticated, yet comfortable, ambiance while cruising the mighty Mekong River. Around every corner, guests will enjoy a blend of timeless elegance and modern luxuries as they experience the sights and sounds of a landscape that forever changes its visitors. 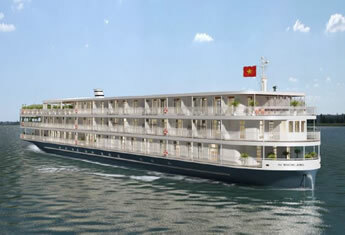 Debuting on January 3, 2020, the Mekong Jewel will be the newest and most luxurious ship on the Mekong river. This all-suite ship will include two dining venues: one main restaurant and an al fresco eatery on the upper deck. 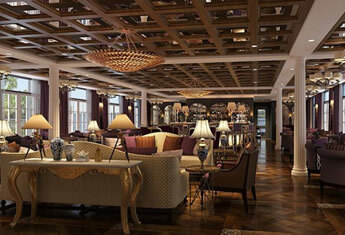 The Mekong Jewel will replace the Mekong Navigator and is being constructed with sustainable, eco-friendly materials, and will feature a swimming pool, spa, sauna and steam room, gym, hair salon, nail bar, two lounges and a library. A tribute to the incredibly flavorful cruising of Southeast Asia, Le Marche will take you on a gastronomic journey of the fresh herbs, fruits, and vegetables that fill the local markets. Gests will also enjoy a variety of western dishes, thoughtfully prepared to provide an array of choices throughout their experience on board. This casually elegant venue will over signature dishes accompanies by complimentary wine in a single, open, dinner seating. Breakfasts and lunches offer sumptuous buffets with extensive choices. Movies and documentaries related to the destination are shown in the afternoon, and local entertainment is provided on selected evenings. 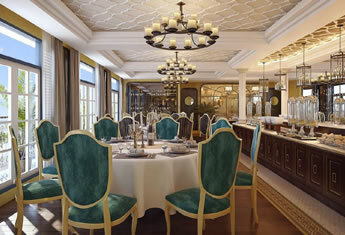 Staying in contact with family and friends is easier on board the RV Mekong Jewel. Located on the Sun Deck, La Biblioteque Library and Internet Lounge is equipped with computers and WiFi, as well as a selection of books written by authors enchanted by their time in Indochina. The Observation Deck on the Mekong Jewel is the perfect place to awaken with a fresh cup of coffee, relax with a good book, or watch the sun set with an evening cocktail. 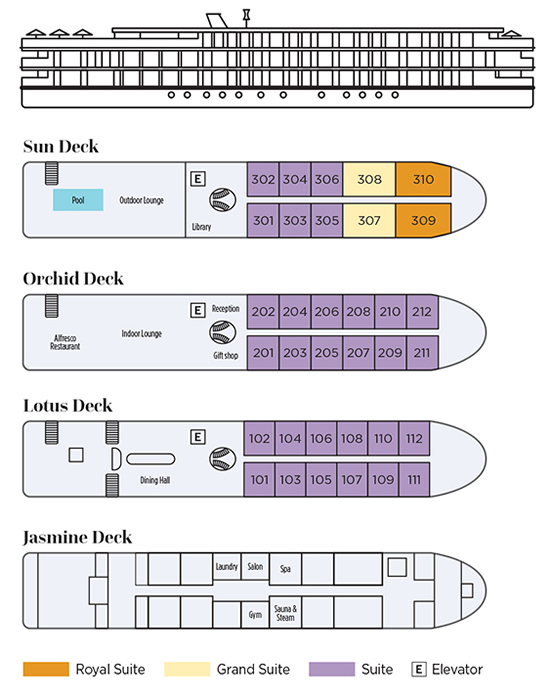 This area of the Sun Deck offers chaise lounges and comfortable, shaded, seating areas, where staff ar always available to offer a cool beverage. The fitness center on board the RV Mekong Jewel offers modern exercise equipment to guests who wish to work off the scrumptious desserts from last night's dinner. La Vie Spa offers a variety of traditional massages, wraps, and aromatherapies, in two private, relaxing spa rooms on the Sun Deck. Accommodations on board the Mekong Jewel provide all the comfort and convenience of a five-star hotel, without denying you the thrills of complete immersion in the Mekong River experience. Spacious, well-appointed suites offer individual climate control, daily housekeeping with turn-down service, the finest bed linens and duvets, luxuriously soft robes and slippers, all-natural, therapeutic bath amenities, and much more. The Reverie Saigon has debuted as the most spectacularly extravagant hotel in Vietnam and as the one and only member property of The Leading Hotels of the World in all of Ho Chi Minh City. Taking pride of place on the topmost floors of the landmark Times Square Building in prestigious District 1, the much-lauded hotel presents world-class hospitality with its impeccable service and its unique celebration of haute Italian design and inimitable luxury. Transcending expectations of place to a modern day exploration of fanciful splendor, the sky-high Reverie Saigon offers an incomparable perspective on the city with its spectacular views. The five-star Victoria Angkor Resort & Spa provides a sense of serenity with the nostalgic comfort and elegant refinement of the French Art de Vivre in the heart of Siem Reap. Conveniently located in the heart of Siem Reap, in close proximity to the Angkor Archeological Area, the quaint Old Market, and the dynamic night markets, Victoria Angkor has been designed in total harmony with its natural surroundings. All accommodations have wooden floors, colonial style furnishings, and original artifacts, adding a warm touch of local culture, and open onto large balconies overlooking the saltwater pool set in lush, tropical gardens. The Hotel Metropole Hanoi is an award-winning French colonial-style hotel lying in the heart of Hanoi, near Hoan Kiem Lake and the magnificent Opera House. Boasting a classical white façade, green shutters, original wrought iron detail, wood paneling and a lush courtyard lawn, the hotel is one of the region's few remaining hotels of its era. The property offers 364 rooms & suites, complemented by a choice of three restaurants (French, Vietnamese and Italian), three bars, seven function rooms, a heated swimming pool, health club, the luxurious Le Spa du Metropole, complimentary wifi and for hotel guests a daily tour of the recently opened war-time bomb shelter and Path of History guided by hotel's Ambassador of History. Aboard the Mekong Jewel, attire is casual and comfortable during the day, with resort-style clothing, and comfortable, but sturdy, footwear for excursions. Evening wear consists of open-neck shirts, trousers, skirt, or similar attire. Footwear is always required in all public areas, and when navigating stairs on board. The official currency of Vietnam is the Vietnamese dong. It is advisable to exchange at least a small amount of money into Vietnamese dong on arrival, especially for purchasing items from small, local merchants and restaurants, and for taxis, which typically do not accept other currencies. Some large merchants and restaurants will accept US dollars. ATMs in Vietnam only provide Vietnamese dong. The official currency of Cambodia is the Cambodian riel. However, most monetary transactions, including withdrawing cash from ATMs and banks may be in US dollars. Should you be due change in an amount less than US $1, you will be given riel; otherwise, US dollars are given. Visa and MasterCard are widely accepted in both countries by many merchants. You may find, however, that some are reluctant to take credit cards for small purchases because of the fees associated with the transaction. Therefore, we suggest that you carry some cash, whether local currency or US dollars. Aside from the international hotel chains, American Express is not widely accepted in this part of the world. You may exchange currency at banks, currency exchanges, or hotels, all with very similar rates. Please note that both currency exchanges and ATMs charge fees. You are advised to inquire as to the currency exchange fee before making the exchange; ATMs will require you to accept the charge before proceeding to dispense cash. The official currency on board the Mekong Jewel is the US dollar. During the cruise, we operate on a cashless system, with all purchases billed to your onboard account. At the end of the cruise, bills may be settled in cash with US dollars or by credit card with Visa, MasterCard or American Express. The Mekong Jewel does not provide a currency exchange service, nor is there an ATM on board. It is advisable to bring crisp, new, undamaged bills, as tears and obvious wear may cause banks and local businesses to refuse them. In Phnom Penh, about halfway through the cruise, you will find multiple options for obtaining US dollars at both Cambodian and international banks, ATMs, and wire services. ATMs are widely available in Vietnam, as well, but will only provide Vietnamese dong. The voltage in both Vietnam and Cambodia is officially 220/50Hz. To use any electrical product from the US that is not dual voltage, you will need an electrical converter. The Mekong Jewel has multi-configuration outlets, which accommodate most Western plugs. We recommend bringing an adapter for use in the hotels. Because the voltage may fluctuate at times, we also recommend unplugging your devices when not in use or when leaving them unattended. Excursions are led by expert guides, and guests are divided into groups. Electronic listening devices are complimentary to all guests in order to ensure that guests are able to hear their guides, without disturbing nearby wildlife. Only guests who possess tickets for passage are allowed on board. Security services are provided on board to ensure everyone's safety throughout the journey. Please do not drink the tap water while on board or on shore, or use it for brushing your teeth. The ship's water supply comes from the river after passing through a sterilization process. This water is suitable for showers and baths, but should not be consumed. Complimentary bottled water for drinking and brushing teeth is provided on board, as well as during excursions. Ice on board the ship is also made from bottled water. Many of the local customs in Vietnam and Cambodia differ greatly from Western culture. In many temples, and on the grounds of the National Palace in Phnom Penh, it is required that all guests cover their knees and shoulders when entering the grounds. Shoes will need to be removed when entering some buildings. Our itinerary takes us into areas where locals are simply living their daily lives. Should you wish to take a photo of locals, please request their permission first (simply pointing to your camera and allowing them to nod is sufficient). 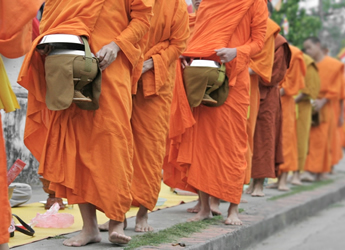 Monks wearing saffron robes will be encountered in numerous places in Cambodia. • Visit the 12th century Angkorian temple complex of Wat Nokor Bachey. • Glide in wooden sampans to the historic An Kiet House and gardens in Cai Be, Vietnam. • Ride a Vietnamese tuk-tuk, or xe loi, to a family-owned mat weaving workshop. • Take a cyclo tour of Phnom Penh, including the Royal Palace, Throne Hall, Moonlight Pavilion, and the National Museum collection of Angkorian artifacts. 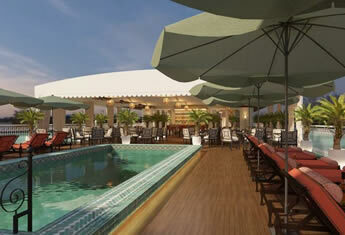 • See Phnom Penh’s famous Silver Pagoda, home of Cambodia’s Emerald Buddha and the diamond-encrusted Maitreya Buddha. • Travel to Choeung Ek and see the Khmer Rouge Killing Fields, the memorial stupa, and Tuol Sleng (S-21 Prison). • Tour a local school in the village of Wat Hanchey and receive a traditional Buddhist water blessing from the monks at the local monastery. • See Kampong Cham’s Phnom Pros (Man Hill), Phnom Srei (Woman Hill), the 33-foot long reclining Buddha, and the 42-foot tall preaching Buddha. Arrive at the Siem Reap airport, where you will be greeted by a Brand g representative, who will transfer you to the elegant and serene Victoria Angkor Resort and Spa hotel. There will be an informal meet and greet around 5:30 for those who have arrived. 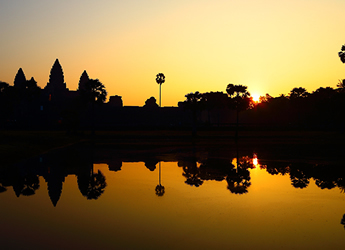 You’ll begin your day at Angkor Wat, the most recognizable landmark in Cambodia, and the largest religious monument in the world, with the longest continuous bas-relief sculpture in existence. Enjoy lunch at a local Khmer restaurant. Tour the city center of Siem Reap by tuk tuk (motorcycle rickshaw), this afternoon for an introduction to Siem Reap’s many dining and shopping options, and a stop at a traditional artists’ workshop. This evening, guests will enjoy a private dinner with Apsara show at our hotel. This morning, we enter through the south gate of Angkor Thom for a guided tour of Bayon (the temple with the faces), then walk around the back of Bauphoun, and along the Terrace of the Elephants and the Terrace of the Leper King. 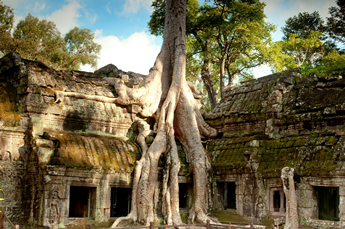 We continue to visit Ta Prohm, which has been overtaken by the jungle, with tentacle like tree roots spilling over centuries old walls and roofs, enveloping much of the structure. Enjoy lunch in a local restaurant. This afternoon, you’ll visit Banteay Srey, considered to be the pinnacle of artistic achievement at Angkor, and Banteay Samré. Enjoy this evening at your own leisure. This morning is yours to relax and enjoy the hotel property or do some last minute shopping. This afternoon we travel to Kampong Cham to embark the ship. Following the informative Welcome Briefing, and meeting with our friendly crew, a Cambodian theme dinner is served in the Le Marche Dining Room. This morning, you walk up the hill to the local monastery of Wat Hanchey and receive a traditional Buddhist Water Blessing from the resident monks. After enjoying a walk around the monastery and the amazing views of the Mekong River valley, you descend 303 steps and return to the ship. *For gentle walkers, there is a coach provided bringing you up to the hill. 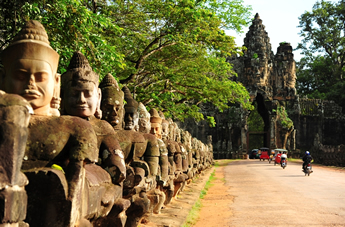 In the afternoon, we will visit the charming town of Angkor Ban. Here, you will have a glimpse into the lives of the local people, starting with a visit to a family’s home to see how the locals live, along with an opportunity to meet the family and discuss their lifestyle. Next, you will continue through the village to the local private school, where you will join the children in their classroom and experience what their typical school day is like. You will then walk back through the village to the ship, with an opportunity to take photos along the way, including a brief stop at the local monastery complex. After breakfast on board this morning, guests meet their cyclo driver for an exciting morning city tour of Phnom Penh. You are gently transported by your driver along the riverfront to the Royal Palace complex. Here guests enjoy a leisurely walk through the grounds viewing Throne Hall and Moonlight Pavilion, before visiting the famous Silver Pagoda, home of Cambodia’s Emerald Buddha and Maitreya Buddha encrusted with more than 9,000 diamonds. Guests return to their cyclos for the short ride to the National Museum ending the morning with a comprehensive tour of the many Angkorian-period artifacts excavated at the Angkor Temple complex at Siem Reap. Guests will enjoy a free afternoon in Phnom Penh with a variety of optional excursions which to pick from, or simply enjoy their time independently shopping or at one of the many wonderful restaurants and pubs nearby. Before dinner, children entertain guests on our Sun Deck with a cultural performance including Apsara, Cambodia’s national dance as well as local traditional folk dances. In the morning, learn more about the darkest days of Cambodian history. After a scenic 45-minute drive from the ship, you arrive at the Choeung Ek killing fields, where you may walk through the fields, visit the small museum and Memorial Stupa, and learn more about the atrocities committed during the Khmer Rouge regime. Before returning to the ship, tour Tuol Sleng (also known as S-21), the former school converted to the main prison and torture headquarters of the Khmer Rouge. After returning to the ship, enjoy a free afternoon in Phnom Penh – shopping, dining at one of the many wonderful restaurants, or exploring the city independently. Morning Departing Phnom Penh to sail downstream to the Cambodia Vietnam border. This morning we sail downstream to the Boarder. 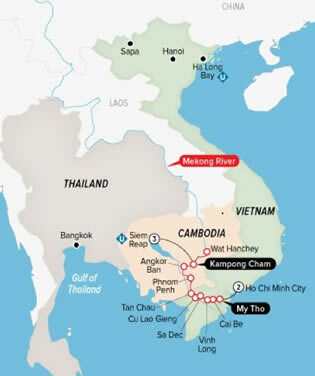 Enjoy a leisurely Cruise and taking in the sights along the Mekong River. Late afternoon Boarder formalities and cruising to Long Khanh Island. This morning sampans take you to the local island village of Hong Ngu, not far from the Vietnam- Cambodia border. Hong Ngu produces a large number of the traditional, Khmer scarves exported to Cambodia. Woven in many homes around the village, you will have the opportunity to see the weaving process under several homes. Some villagers are also embroidery artists, displaying their art in and around the homes. The inhabitants of this area had only encountered one western visitor prior to the arrival of the Mekong Navigator, and are especially friendly and welcoming. Before returning to the sampans, we will walk around this evergreen island and visit the home of a local War Veteran. In the afternoon, your sampans will bring you Gieng Island with visit to a local village where hundreds of sampans and rowing boats are made daily. Experience a sampan cruise to untouched canal and finally visiting to the Gieng Cathedral built in 1879 right after the Notre Dame Cathedral in Saigon in 1863. Upon arrival to Sa Dec, your sampans return for a leisurely, scenic navigation of the narrow canals of the Mekong, where you will observe daily routines of the villagers en route to the historic town of Sa Dec. A stop is planned at a Cao Dai Temple, but a visit is depending on the Rivers water-level and accessible disembarkation area. Then in the town of Sa Dec you visit the home of Mr. Huynh Thuy Le, the inspiration of Marguerite Duras’ novel, L’Amant (The Lover), as well as the Chinese Temple which was build in honor of the Huynh Thuy Le Family where you will be welcomed by traditional Chinese Lions Dances. On your itinerary is a walk through the town’s market, where you experience the sights, sounds, smells and provides you photo opportunities of the colorful fresh produce, meat, live fish and seafood for sale. 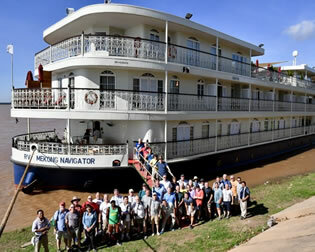 After returning to the ship for lunch guests enjoy an afternoon cruise to Cai Be. We pass the city’s beautiful French gothic cathedral then tour the historic An Kiet House with its beautiful surrounding gardens. Following we board our sampans to visit a traditional rice factory where workers produce rice paper, rice wine, popped rice, and many varieties of traditional candies. In the evening, you gather in the Sun Deck in front of the Le Salon Lounge this evening for a Farewell Reception with the entire crew, before enjoying a Cambodian Farewell Dinner in Le March Dining Room. After breakfast, bid farewell to the Mekong Jewel and enjoy a scenic drive to Ho Chi Minh City, where we begin our tour of the city’s incredible French Colonial architecture of the Notre Dame Cathedral and Central Post Office. Today’s lunch is at Hoi An restaurant. Created and designed in the architectural themes of the ancient towns of Hoi An and Imperial Hue, Hoi An restaurant specializes in the cuisine of the former imperial capital. Tonight is yours to enjoy at your leisure. After breakfast at the hotel this morning, enjoy a tour to the Cu Chi Tunnels to experience the system of underground passages. This evening we bid farewell, with dinner at the Ly Club. Taking their name from the Ly Dynasty, which set the benchmarks of Vietnamese culture centuries ago, Ly Club combines traditional Vietnamese, classical French cooking, and exotic touches from around the world. After breakfast say Good Bye! to your new Brand g friends, check out our deluxe, centrally located luxury The Reverie Saigon Hotel and transfer to the airport for your flight home. Hotel check out is at Noon. 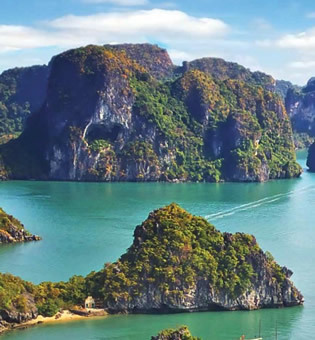 Begin your journey with an optional four-night pre program extension, featuring the famed UNESCO World Heritage site of Ha Long Bay, including two nights at the luxurious Sofitel Metripole Legend Hotel and two overnights aboard the Paradise Elegance ‘junk’ boat in beautiful Ha Long Bay. • Ha Long Bay overnight cruise package including: 2 nights cabin accommodations on Paradise Elegance junk boat; lunch, dinner, brunch; excursions to Thien Canh Son cave and beach. Initial deposit is $850 person. Balance payment is due 120 days before cruise. Cruise Port Charges of $180 per person are additional. Single supplement of $2500 applies to single occupancy bookings in Vista and Superior Suites (Grande and Prestige 100% single supplement applies).